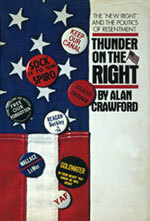 Published in 1980, Thunder on the Right: The ‘New Right’ and the Politics of Resentment was the first (and definitive) expose of the conservative movement that, within months of the book’s publication, defeated five incumbent Democratic senators and elected Ronald Reagan to the presidency. One of the most widely reviewed books of the year, Thunder on the Right received respectful notices in The New York Review of Books, The New York Times Book Review, Fortune, In These Times, Newsweek, The Washington Star, The Baltimore Sun and numerous other magazines and newspapers. Thunder on the Right, soon to be available as an e-book, still the most extensive and prophetic survey of a political movement that is more important today than ever.